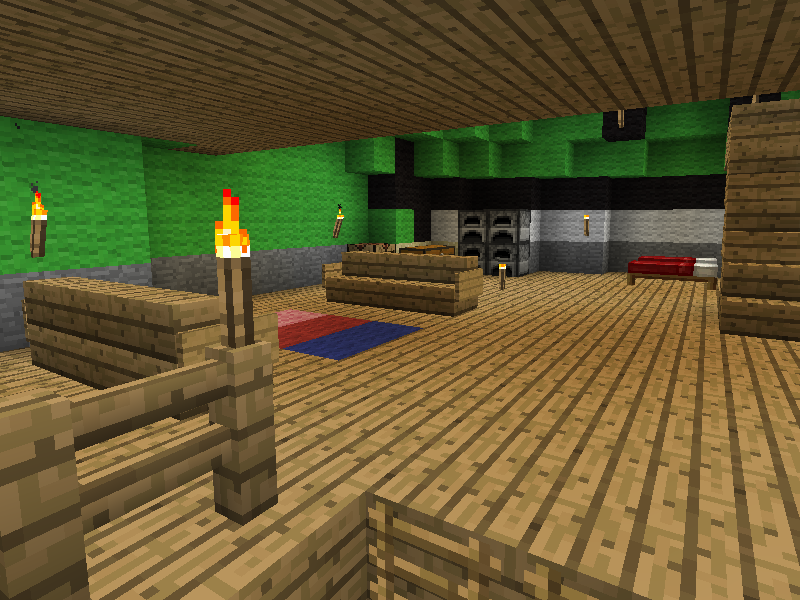 A while back, the old multi-player Minecraft server I used to play on closed its doors and was taken off-line. Graciously, the owner packed up all the files and sent me a copy of the world map so that I could still access the builds on there I’d created. After bunging my recent piccies on Imgur, I’d meant to revisit those old builds and create some larger, clearer screenshots. Well, here they are! Click on the thumbnails for the bigger versions. The first new screenshot comes from the bug-eyed Fish I plopped down in the river running along my ‘island’ (first mentioned in this post). As you can see from the shot on the right, the interior of the Fish is surprisingly spacious. I didn’t really need it for anything so everything I put in there was for during its construction. The bed to skip the nights (pesky zombies kept swimming up to say ‘Hi!’), chest for temporary storage plus the usual crafting table and furnaces. Once it was built, I thought it looked very sparse so I stuck in a second floor to break the space up and added the chairs/carpets to make it look a little more homey. 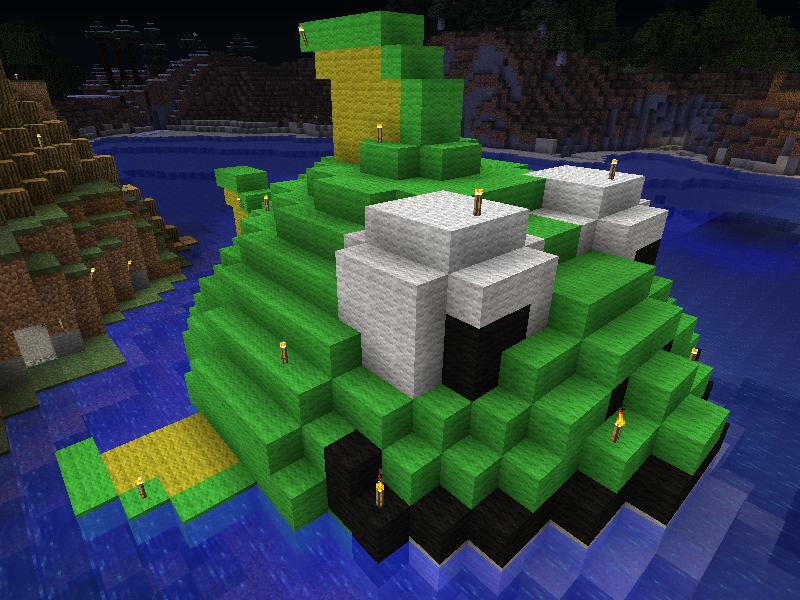 The second thing I constructed on the this server (apart from the bridge and dock) was a special build for Halloween. On the far side of the bridge, in the water facing the town, I placed a large Skull on a spike (original post here). Along the back of the spike, from the waterline, there’s a ladder which runs up through the inside of the skull providing access, all the way up to the ‘roof’. 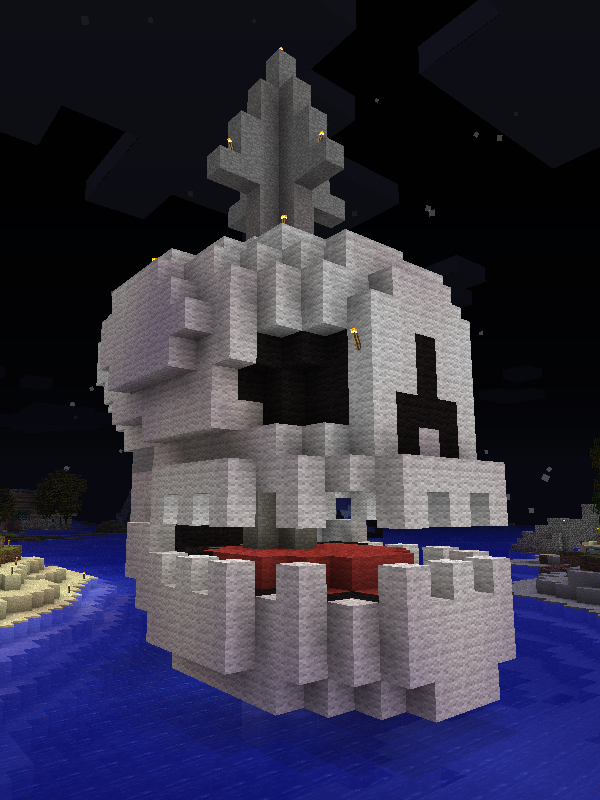 Now that Minecraft has a greatly increased max-height build ceiling, it would probably be cool to extend the stem of the spike (make it a pike, as it were), and have the skull top it off, looking out across the landscape. 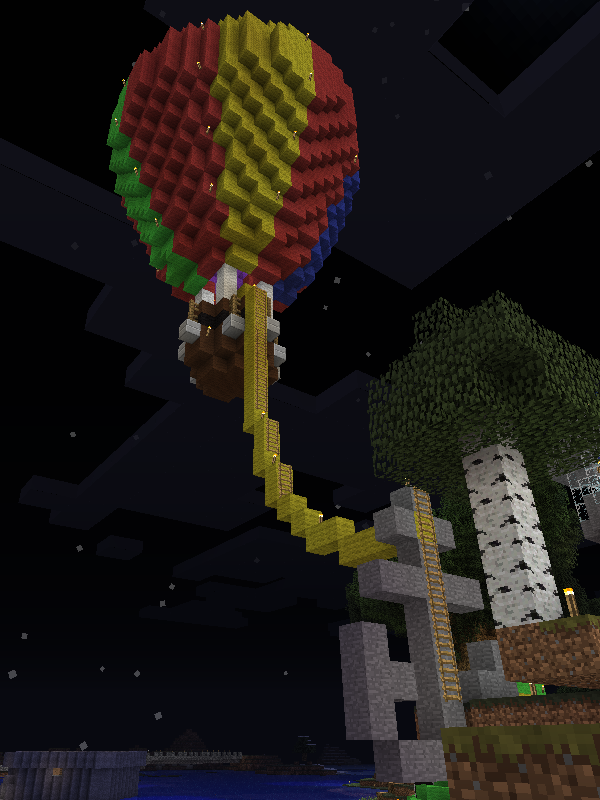 The third build in this post was my first attempt at making a sky situated build – the Hot-Air Balloon (original post here). It needed an absolute f-ton of differently coloured wools to construct but was a lot of fun. The thing I like about this one is the over-sized anchor and ‘rope’ used as an excuse to provide access to the basket and balloon itself. It looks like it belongs and then you notice the ladders. I’m thinking of creating a walk-through video of my builds on this server, showing each of these constructions (and maybe a couple of the far bases). If there’s any interest, I could probably also create some schematics of the Fish, Skull and Hot-Air Balloon and make them available for download. Drop me a note through my YouTube channel, twitter or email (the address is over on the right), if you’re interested in seeing that happen.